Scottish charity group Royal Blind announced that it gave away £160,000 in grants in the past year to help fund research into major eye diseases. Members of Royal Blind hope that this new research will help future eye doctors prevent and treat potentially blinding diseases like glaucoma. The four areas of study Royal Blind funds include glaucoma study, gene therapy, retinal surgery, and retinoblastoma treatment. Interested scientists can either apply for small grants (under £10,000) or large grants (between £10,000 and £60,000). Royal Blind started this grant campaign back in 2014 with the help of the Royal College of Surgeons of Edinburgh. In total, Royal Blind offers £170,000 in grants to fund research into new treatment strategies for blinding diseases. Royal Blind executives say they will make these funds available to researchers for at least the next three years. Mark O'Donnell, the chief executive at Royal Blind, said the relationship between Royal Blind and the Royal College of Surgeons is incredibly strong and productive. O'Donnell hopes Royal Blind's funds will help "leading scientists in finding new ways to tackle and treat [eye] conditions." 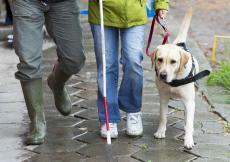 Founded in 1793, Royal Blind has always been dedicated to helping those with visual impairments lead fulfilling lives. One way Royal Blind achieves this goal is by providing education and employment opportunities to legally blind patients in the community. Today, Royal Blind is composed of many organizations such as the Royal Blind School, a residential care facility called Forward Vision, and the Scottish Braille Press. Also, the Scottish War Blinded, which helps Scotland's brave soldiers, is Royal Blind's official sister charity. The Royal College of Surgeons of Edinburgh dates back to the 16th century and is still considered one of the finest surgical universities in Europe. There are now around 20,000 official members of the Royal College of Surgeons all around the world. The Royal College of Surgeons' main campus is on Nicolson Street in Edinburgh. Anyone interested in finding out more information about Royal Blind's funds can call the charity on enquiries@royalblind.org.